Graze in Peace will be hosting a free Gentle Thanksgiving potluck celebration at the Durham Community Center from 1:30-4pm on Saturday, November 17, 2018. Bring a favorite vegan holiday dish to share with friends, and spend a little time socializing and relaxing during this busy time of year. 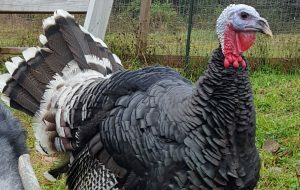 If you can’t make the event, you can still celebrate the “gentle” lives of turkeys by becoming a turkey sponsor. Click here to find out more! 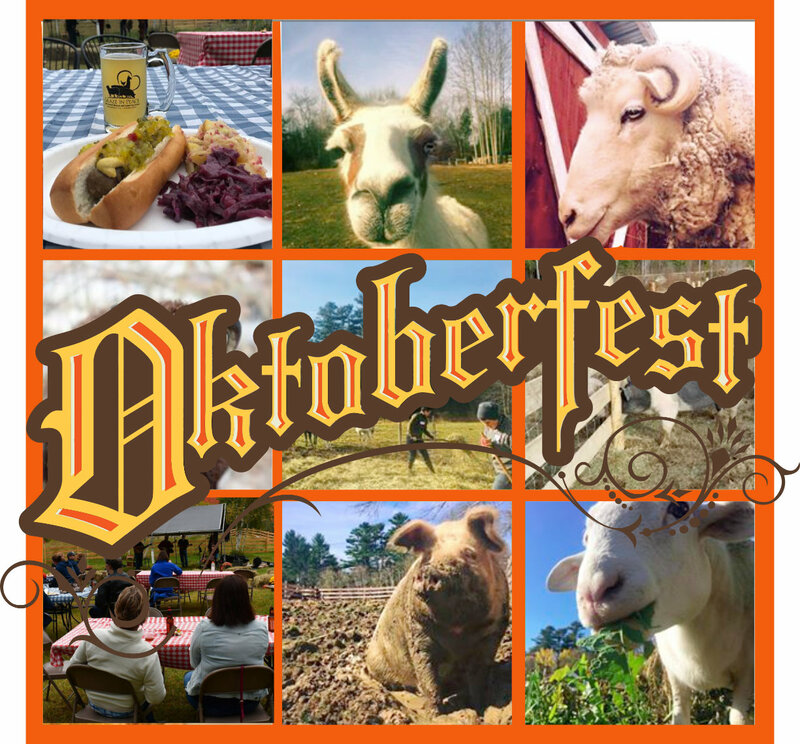 Thank you to everyone who supported our 2018 Oktoberfest Celebration! celebrate the rescued animals and the people who work so hard to give them the lives they so deserve. We once again raised over $4500 and will use the funds to support our farm animal rescue program. Thank you! to all of our donors, sponsors, volunteers and attendees for helping pull together another major fundaising success! If you’d like to get involved in helping us rescue and care for more farmed animals, please visit our “How to Help” page. Graze in Peace has received a grant through the MSPCA that will allow us to complete several much-needed projects by the end of this year! 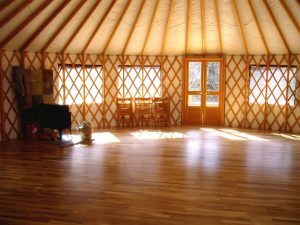 Projects (some already in the works) will include underground water and electricity to animal quarters, a new pig house and quarantine space, a humane education building (yurt), and a new hay barn with animal stalls and a public restroom. Please join us in thanking Mike Keiley, Director at the MSPCA, who was essential in making this grant possible. His patience and generous amounts of time have made a huge difference in our lives and the lives of the animals who call Graze home. Strawberry is enjoying a new lease on life since he was surrendered to Graze in Peace by his family in Windham late in September. Strawberry was “won” by a little girl in a pig scramble — a terrifying and extremely cruel event common at many back-country fairs in Maine and throughout the United States. During the event, crowds of fair-goers gather around an arena to watch baby piglets who’ve been forcefully removed from their mothers, greased with a slippery substance and set in a pen full of overly excited children or adults who then chase and manhandle them until they are caught and stuffed into a sack. Though pigs have been proven to have the intelligence of a three-year old child and superior intelligence to dogs,* supporters of this activity see no wrong with treating these animals in this way and are often quoted as saying the piglets squeal in delight. As caretakers of pigs for many years, we can attest to the fact that pigs do not squeal in delight. When they are happy, they wag their tails and sometimes grunt or bark like a dog, but never squeal. They squeal when fighting over a bowl of food. They squeal when being forced into a situation they can’t get out of. They sometimes squeal when their tusks are trimmed. And they squeal when they are accidentally stepped on by a sibling settling down for the night. But they never squeal with pleasure. 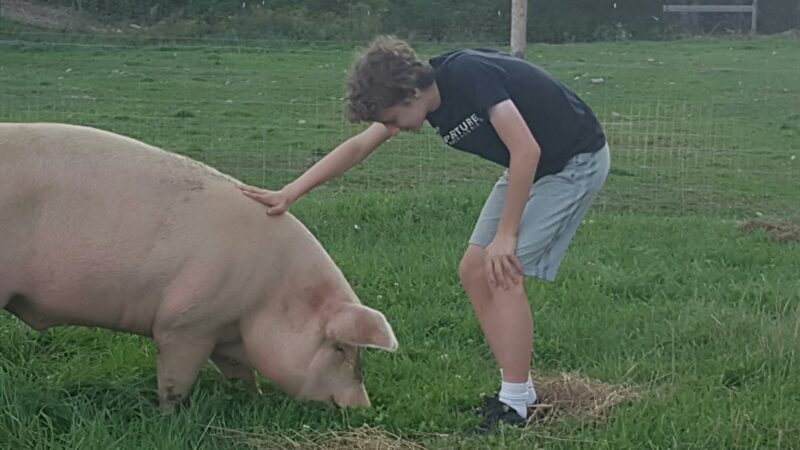 As we ramp up our humane education and outreach programs, we plan to shed more light onto who pigs really are and how they need to be respected as intelligent and feeling beings who, if given a chance, will form family attachments for life and are deserving of much more better treatment than these traumatic fair contests force them to endure. We also are committed to teaching children a more appropriate and humane way of seeing and treating other beings, both human and non-human. Copyright © 2019 Graze in Peace. All Rights Reserved.